I have had the great pleasure of interviewing legendary actress, author and activist Jane Fonda many times over the years. The first time I met Jane was when I covered the 1992 March for Women's Lives in Washington, DC as a reporter for Us Magazine. It was at that event that I first became aware of how Jane purposefully and strategically uses her fame and influence to draw attention and awareness to important causes, something she has been doing in many meaningful ways for decades. At 77, Jane is still as active as ever, speaking out through several organizations she co-founded (Women's Media Center and the Georgia Campaign for Adolescent Power and Potential) as well as starring with Lily Tomlin in a new series for Netflix premiering on May 8th called Grace and Frankie. Of the series, which also co-stars Martin Sheen and Sam Waterson, Fonda says, "I'm pretty excited about it. It's is the kind of thing I like a lot -- funny and also there are tears." 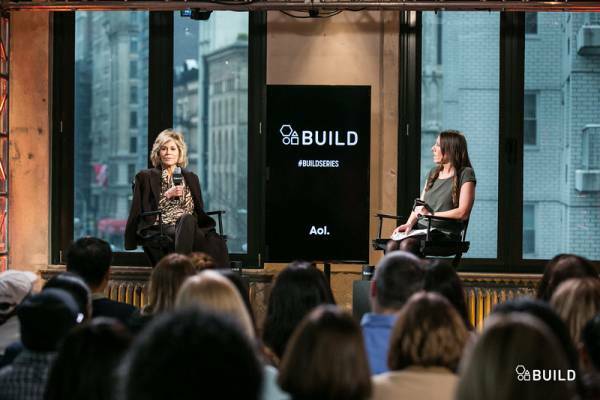 I recently sat down with the iconic Academy award-winning actress (and best-selling author of seven books) for a far-ranging conversation for AOL BUILD in which we talked about a variety of topics. These included the need for more women's voices and diversity in Hollywood and the media ("Media creates consciousness. It's the modern day oral tradition... Only 3% of decision-making positions are held by women... we're just not getting the full story..."); what drives her activist work ("Celebrity can be really alienating... why have celebrity unless it can be used for something good?.... I was raised to believe that activism is the rent you pay for life..."); the importance of being "whole" ("Being whole means being authentic..."); how, at 77, she is still "trying to grow as a person" ("You can't have empathy for others until you have empathy for yourself..."). In our very candid interview, she seemed inspired to share with the audience some of the deep life lessons she has worked hard to uncover for herself: "Learn from your wounds and scars;" "Don't get cynical -- cynical is the death of us all;" "Being interested in more important than being interesting." And, she repeatedly emphasized how important it was to take the occasion to "look into people's eyes and acknowledge each other's humanity," "really connect with people" and "understand our common goals and suffering and joy." Said Fonda, "That's the kind of thing that keeps me going and inspires me. We have to keep reminding ourselves of that. " Marianne Schnall is a widely published writer and interviewer whose writings and interviews have appeared in a variety of media outlets including O, The Oprah Magazine, Marie Claire, CNN.com, the Women's Media Center and many others. Marianne is a featured blogger at The Huffington Post and a contributor to the nationally syndicated NPR radio show, 51 percent The Women's Perspective. She is also the co-founder and executive director of the women's website and non-profit organization Feminist.com, as well as the co-founder of the environmental site EcoMall.com. She is the author of Daring to Be Ourselves: Influential Women Share Insights on Courage, Happiness and Finding Your Own Voice based on her interviews with a variety of well-known women. Marianne's new book is What Will it Take to Make a Woman President? Conversations About Women, Leadership, and Power. You can visit her website at www.marianneschnall.com.